Project MPSV06 was designed by Marine Engineering Bureau of Russia. Image courtesy of Marine Engineering Bureau. The MPSV06 is an an ice-breaking rescue and salvage vessel. Image courtesy of Marine Engineering Bureau. Two vessels will be delivered to State Maritime Rescue Coordination Centre (SMRCC) by the end of 2015. Image courtesy of Marine Engineering Bureau. The keel laying ceremony for the two vessels for SMRCC was held in November 2013. Image courtesy of Marine Engineering Bureau. Project MPSV06 is an ice-breaking rescue and salvage vessel designed by Marine Engineering Bureau. The keel for the first Project MPSV06 vessel, named Spasatel Petr Gruzinskiy, was laid in July 2010 at Amurskij shipbuilding yard, for the Ministry of Transport of the Russian Federation, and is yet to be delivered. 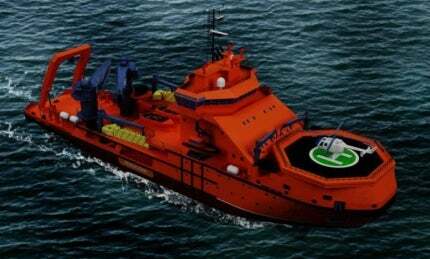 State Maritime Rescue Coordination Centre (SMRCC) has ordered two Project MPSV06 ships. The two vessels will be built at the Wismar Yard of Nordic Yards and are scheduled to be delivered by 2015. The first steel was cut in September 2013 and the keel laying ceremony was held in November 2013. The MPSV06 is 87.75m long and has a moulded breadth of 18.5m. Its length between perpendiculars is 70.60m, operating draft is 6.52m and deckhouse weight is approximately 2,500t. The vessel has a sea endurance of 30 days. MPSV06 has been assigned the Russian Maritime Register of Shipping (RS) class notation KM *Icebreaker6  AUT1-ICS OMBO FF2WS EPP DYNPOS-2 Tug SDS<60. The main tasks of the MPSV06 ship will be rescue and salvage operations in the areas of navigation, fishing and oil and gas recovery. The ship’s ice-breaking capabilities will allow it to operate in ports and frozen harbours including freezing non-Arctic seas where the ice thickness is less than 1.5m. Brittany Ferries placed an order for a new cruise-ferry named PEGASIS in January 2014. The ship will provide technical support and assistance to vessels in distress. It will also search, rescue and evacuate people in emergency situations, and will be capable of pumping out 1,700m³ of water per hour from flooded compartments of other ships. MPSV06 will be outfitted with advanced technologies to investigate sea bed and damaged objects up to 1,000m deep. Two underwater diving complexes, a remotely operated deep-sea submersible of the Scorpio type and a side-scan sonar device will be provided. The vessel will carry out fire-fighting and emergency towing operations and will also be provided with machinery needed to survey and clean underwater hull parts of vessels. The vessel will be equipped with a high-speed working boat that can reach a maximum speed of 35k and carry 24 people. It will feature two marine evacuate systems for rescuing people from surface water. These systems will consist of closed life rafts, platforms for people and slides to reach the rafts. In addition, a special life raft will be fitted to lift people from water and a special net for lifting a group of people. The ship will be equipped with onboard trawl system, two brush-type skimmer systems, two boom complexes and two boom-handling boats to recover floating pollutants (oil and similar substances) and separate them from water. "A helipad will be built at the fore end." FF2-class fire-fighting equipment will be fitted on the vessel to combat fire on other vessels. Water curtain and spraying systems and powder fire-fighting system will be fitted out for this purpose. A helipad will be built at the fore end. Marine towage operations will be provided by a towage winch, with a pulling capacity of 90t, located at the aft. The ship will be endowed with two knuckle boom cranes with an outreach of 22.5m and a lifting capacity of 32t. An A-frame crane with a lifting capacity of 80t will also be fitted for lowering and lifting of the Scorpio-type deep sea submersible, boats and diving equipment, and handling oil spill combating equipment. The vessel can accommodate 26 crew members, including two medics, 12 special personnel and 95 survivors. The MPSV06 vessel will be fitted with a diesel-electric propulsion system, which includes four diesel generators with capacity of 10.6MW. Two AC propulsion motors will drive two full-circle rudder propellers with a power capacity of 3.5MW, equipped with fixed pitch propellers without nozzles on each screw. The vessel will feature two bow thrusters of screw within tube type with capacity of 1,400kW each. The propulsion system will allow the vessel to cruise at a maximum speed of 15k. ABB will supply 3.5MW Azipod VI units, main switchboards, drives, bow thrusters and generators for the two ships ordered by Rosmoport under a $25m contract in September 2013.